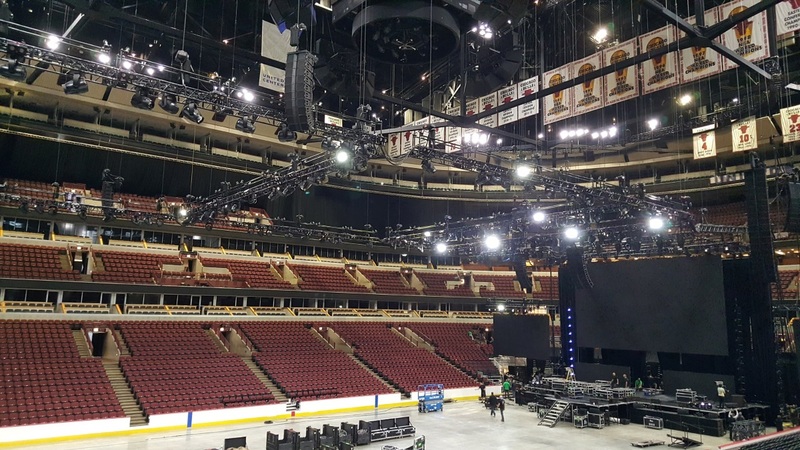 Behind the scenes with the systems supporting Tony Robbins' “Unleash the Power Within” event at the 23,500-capacity United Center. Jason Stygar of MLSound at front of house for another recent event, working with an Avid Profile console and more Focusrite interfaces (rack-mounted to Scherban's right). MLSound operates out of Knoxville, TN with a tagline reading: “Large enough to serve, small enough to care.” At a recent Tony Robbins event at the United Center in Chicago, the company demonstrated what that means. Founded 26 years ago by David Akers, MLSound has evolved into a local mainstay of AV services for both the rental integration markets throughout the southeast. Justin Slazas joined the team three years ago to run the touring and rental division of the company, and after about a year, he decided to move into a managing partner position to help drive the long-term growth and ultimately buy into the company. 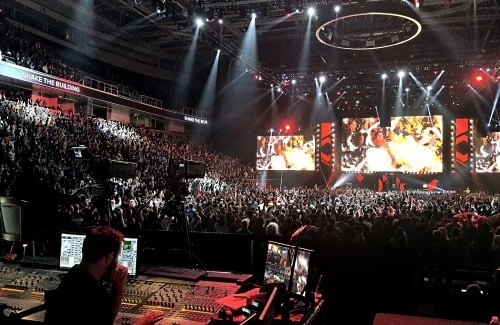 Since then, MLSound has steadily invested in both equipment and top technicians, with a goal of becoming a true force in AV production, installation and touring. One of the first key decisions in that direction was to implement Audinate Dante audio networking as the foundation for device connectivity. It’s helped the company in handling larger and more complex events, providing the ability to meet scale, distance and quality requirements more quickly and reliably. For the uninitiated, Tony Robbins is a popular motivational speaker and author noted for presenting energetic multi-media, multi-day events that encourage audiences to strive to meet goals and attain personal satisfaction. Robbins Research International has been a steady client of MLSound on domestic events over the last three years, and for Robbins’ three-plus-days “Unleash the Power Within” program at the 23,500-capacity United Center, Slazas worked with colleagues Scott “Scoobie” Scherban and Jason Stygar to design, deploy, and operate the program’s sound reinforcement system. The wide-scale loudspeaker set going into place for “Unleash the Power Within” program at the United Center. Scherban started mixing sound in the 1980s when analog ruled the world, starting at then-market leader Tasco Sound and working with many top touring acts and production companies. He’s witnessed firsthand pro audio’s transition to the digital realm and is now as familiar with IP addresses as he is with faders. Stygar hails from St. Louis, where he started mixing sound as part of church services his family attended, in addition to playing in bands. He came into pro audio at what he calls “the tail end” of analog before moving to digital, and, like Scherban, finds his analog background to be useful in visualizing work on modern networks. 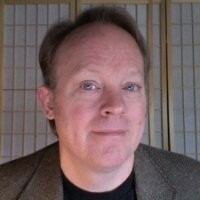 Brad Price is the senior product manager at Audinate and has an extensive background in audio engineering, music performance, and software product development.